We’ve previously taken a look at the age distributions of the 2015 Grand Finallists and of all teams in Round 4, 2016. 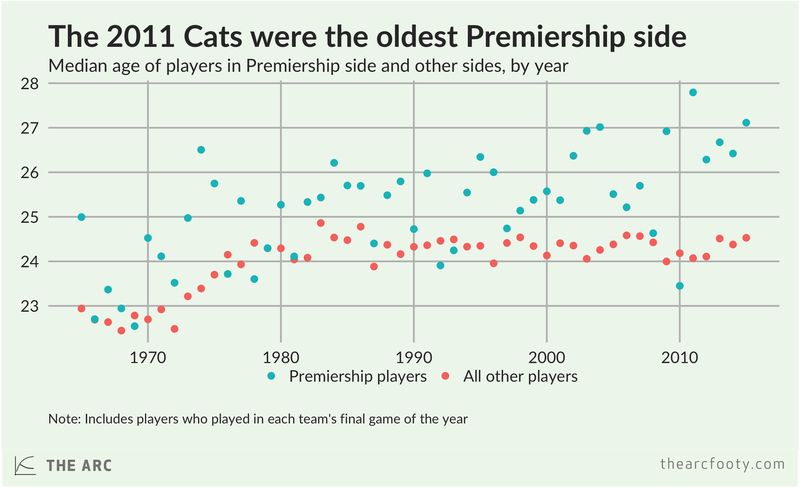 But that leaves a question – how old is the typical Premiership team? Six of the past seven teams have had a median age of between 26 and 28. The median, as you’ll remember from high school maths, is the age of the player in the middle of the team, if you lined up all the players from youngest to oldest. The 2010 Magpies are the only Premiership team this decade that had a median age outside the 26-28 range, coming in at a strikingly young 23 and a half. The Pies were the only flag-winners that were younger than the rest of the competition since the 1993 “baby” Bombers. I think the median is more informative than the mean (also known as the average) age, because it’s not skewed by outliers. One Brent Harvey or Dustin Fletcher can drag up a team’s average age a lot, but they don’t have the same effect on the median. Still, the median doesn’t tell us everything we want to know about the age distribution of a team’s players. The chart below tells us a little more. 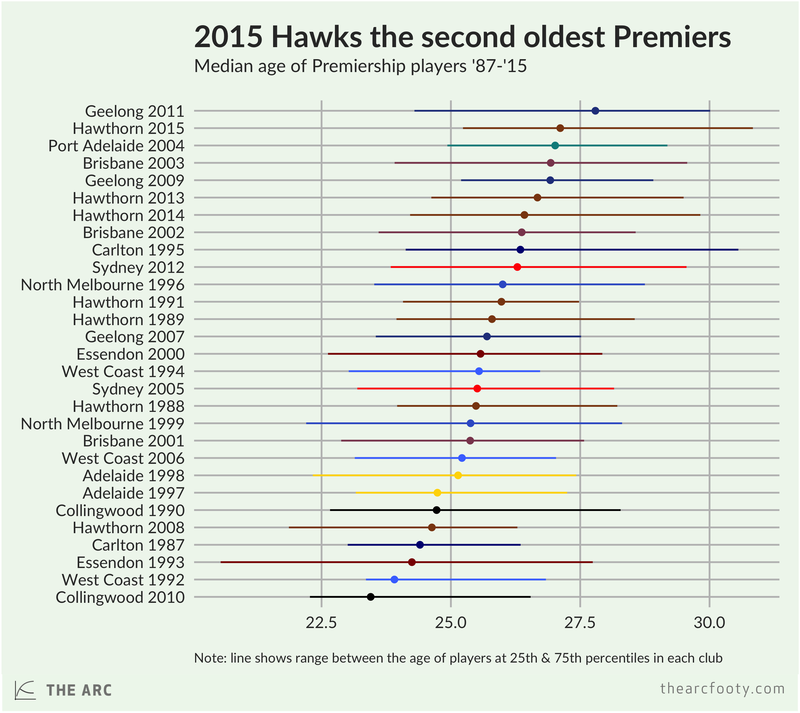 It shows the median age of each Premiership team, just as above, but this chart also shows the range between the age of the players at the 25th and 75th percentile for each club. You can see, for example, that the 2015 Hawks and 2004 Power had a nearly identical median age, but the Hawks skewed a little older – in fact, the player at the 75th percentile of the 2015 Hawks’ lineup in terms of age was the oldest among all the Premiers included in the chart. Two interesting things stand out here. First, the top of the chart is dominated by clubs whose period at the top was coming to an end – the 2011 Cats, 2004 Power, and 2003 Lions sides all faded a fair bit in the seasons following those flags. This raises the question of whether Hawthorn can avoid the same fate. The second interesting thing is just how young the 2010 Pies were. Given all that young talent, it’s really quite surprising that they only won the one flag.